Madam Poppy Pomfrey was the matron at Hogwarts School of Witchcraft and Wizardry. She was a very competent nurse, having been in the position for, at least, the last quarter of the 20th century. She is very possessive of the patients in her care at the hospital wing, and their visitors upset her somewhat, as she frequently insists they must rest. She is proficient in her area of expertise, healing magic, and can take care of some ailments "in a heartbeat". At some point before 1 November, 1981, Madam Pomfrey complimented Dumbledore on a set of earmuffs he had recently acquired. The compliment made him blush in such a manner that would only be rivalled when Professor McGonagall compared his magical prowess satisfactorily against Voldemort's. Harry: "You let Professor Dumbledore in..."
Pomfrey: "Well, of course, that was the Headmaster, quite different. You need rest." Harry: "I am resting, look, lying down and everything. Oh, go on Madam Pomfrey..."
In 1991 after visiting Rubeus Hagrid, Ron Weasley was required to go to Madam Pomfrey after being bitten by the dragon Norberta. Ron told her that he had been bitten by a dog, but Madam Pomfrey had doubts about it due to the unusual colour of the purple, green, and black wound, but in the end she dropped the subject and continued to treat him after Ron insisted it was a dog. Later on in the year, after Harry Potter fought Professor Quirrell in the Hogwarts dungeons over the Philosopher's Stone, he spent three days unconscious in the hospital wing under Madam Pomfrey's care. She was reluctant for Harry to have any visitors, even Ron Weasley and Hermione Granger as she thought that all Harry needed was bed rest but she allowed headmaster Albus Dumbledore to visit Harry time to time. In 1992, Madam Pomfrey administered Skele-gro on Harry to regrow his bones in the arm after Gilderoy Lockhart's attempt to fix a broken bone failed disastrously. Pomfrey was annoyed that Harry had not been bought straight to her in the first place as re-growing bones is a more difficult task than mending bones, which she claims she can do "in a heartbeat". In the same year, Hermione Granger ended up in the hospital wing for a month after an accident in an unauthorised high-level potion-making (Polyjuice Potion) left her half-feline; apparently the group felt comfortable letting Madam Pomfrey to treat her since she would not ask too many questions and just get on with the job in hand. Hermione was allowed visitors, but it bothered Madam Pomfrey somewhat. Also in the 1992–1993 school year Hogwarts was facing potential closure as a monster had been attacking Muggle-born students around the school. It was Madam Pomfrey's job to make sure that these students were found and treated to the best of her ability, though for those petrified she could not treat students without Pomona Sprout's Mandrake potion. She also refused to allow any students to visit the victims, in fear of the attacker might return to finish them, but allowed Harry and Ron to visit Hermione with Professor McGonagall's permission. Eventually, they managed to get the potion made and cured Hermione Granger, Colin Creevey, Penelope Clearwater, Justin Finch-Fletchley, Nearly Headless Nick, and Mrs. Norris. At the end of the year, Madam Pomfrey and Professor Sprout sat at the staff table and Albus Dumbledore asked the whole school to thank them both for their efforts in helping all petrified students, as well as applauding in Lockhart's departure. Poppy: "Oh, it's you is it?... I suppose you've been doing something dangerous again?" McGonagall: "It was a dementor, Poppy"
Poppy: "Setting dementors around a school... He won't be the last one that collapses. Yes, he's all clammy. Terrible things, they are, and the effect they have on people who are already delicate —"
At the end of 1994 Harry, Ron, and Hermione all had endured injuries following the events that took place when Sirius Black returned to Hogwarts and revealed Peter Pettigrew to be alive. The three all woke up in the hospital wing after Ron broke his leg the previous evening, and both Harry and Hermione had passed out from the Dementor attack along with Sirius Black. Madam Pomfrey was not surprised to have the three in her care again. Whilst in the Hospital Wing, Hermione, at Dumbledore's hint, used her Time-Turner to go back in time with Harry to three hours before. They rescued Sirius Black on Buckbeak the hippogriff to prevent him from being administered the fatal Dementor's Kiss. They managed to get back in time without Madam Pomfrey realising what they had done. Madam Pomfrey also spoke approvingly of Remus Lupin's use of chocolate to relieve the effects of a Dementor's presence on students, commenting that Hogwarts has "finally got a Defence Against the Dark Arts teacher who knows his remedies". When several students, including Fred and George Weasley, S. Fawcett and Summers "decided to age themselves up a little" in order to be eligible to enter the 1994 Triwizard Tournament, Madam Pomfrey had to remove the beards which they had grown in attempting to cross Dumbledore's Age Line. She was most annoyed by the students actions and treated them with regret. She felt that the Triwizard Tournament would bring the school nothing but grief. During the same school year, it was Madam Pomfrey's job to tend to the injuries that the four Triwizard Champions, Harry Potter, Viktor Krum, Fleur Delacour and Cedric Diggory received during the course of the tournament, and expressed distaste for the dragons for the first task. She was also responsible to take the body of Cedric Diggory to the Hospital Wing after he had been killed by Peter Pettigrew under the order of Lord Voldemort during the last task. Later, after being questioned by Albus Dumbledore on the details of the incident, Harry Potter was sent to the hospital where Madam Pomfrey prescribed a Dreamless Sleep Potion for him, in order to get ample rest. In 1996, Hogwarts was under the control of the Ministry. Albus Dumbledore had escaped after facing potential imprisonment in Azkaban and Dolores Umbridge had taken over. Minerva McGonagall, Madam Pomfrey's close friend was hit by four Stunning Spells to the chest by Aurors while Umbridge was trying to sack and remove Hagrid from Hogwarts. Madam Pomfrey was deeply shocked by this attack and was unable to help Minerva. She transferred her to St Mungo's Hospital for Magical Maladies and Injuries where she could receive better treatment by qualified healers. Also, after the Dumbledore's Army's traitor, Marietta Edgecombe, was struck with Hermione Granger's jinx, Madam Pomfrey could not do the slightest in improving the pustules instilled on Marietta's face. Madam Pomfrey considered resigning in protest after the attack, but did not as she cared for the students too much. She subsequently helped treat the assorted injuries that Luna Lovegood, Neville Longbottom, Ginny Weasley, Hermione Granger, Ron Weasley and Harry Potter sustained during the battle in the Department of Mysteries, including a broken ankle, broken nose, and the effects of an unknown curse on Hermione, which if cast verbally could have been fatal. In 1997, Madam Pomfrey examined Katie Bell after she had been cursed by an Opal necklace. She could not help Bell and transferred her to St Mungo's Hospital for Magical Maladies and Injuries for a specialist's opinion. Madam Pomfrey also tended to Ron after he had almost been poisoned after drinking a glass of mead, which had been poisoned by Draco Malfoy in an attempt to kill Dumbledore. She also helped Harry by fixing and mending up his head after he was hit and knocked out by a Quaffle which had been hit by McLaggen during a Quidditch match. Later in the year, Hogwarts fell under attack from the Death Eaters. Several students and Aurors were caught up in the Battle of the Astronomy Tower, a battle which resulted in the death of headmaster Albus Dumbledore. Madam Pomfrey tended to the wounds and injuries of those in the battle; Bill Weasley was injured the worst of all, as werewolf Fenrir Greyback had savaged and bit him whilst in his human form, causing Bill to be badly scarred. Madam Pomfrey noted that there is no cure for werewolf bites and scars. Lupin, being a werewolf himself, assumed that Bill would not take the form of a true werewolf since he might not be entirely infected with Lycanthropy, though he could develop lupine qualities. Since it was an unique case, neither Madam Pomfrey nor the others knew what would become of Bill when he awoke. When he woke up, all that happened to Bill developed a liking for raw meat. Shortly afterwards, Madam Pomfrey attended the Funeral of Albus Dumbledore to pay her respects to her lost colleague and friend. Following the death of former headmaster Albus Dumbledore, Lord Voldemort had taken control of Hogwarts and the Ministry of Magic. He had appointed Severus Snape as Headmaster. Detentions and punishments imposed on students were severe under the cruel Death Eaters Amycus and Alecto Carrow as teachers. Students were noted to be in and out of the Hospital Wing often. In particular, Seamus Finnigan's face was unrecognisable with bruises. Later on in the year, Harry, Ron and Hermione returned to Hogwarts in search of the final Horcrux in Hogwarts, triggering a battle. The staff and students defended the school against Voldemort and his Death Eater army bravely whilst Harry searched for the Horcrux. At the end of the Battle of Hogwarts, students and staff alike were injured, or even killed. After the battle Madam Pomfrey tended to all the injured and dead. By 2014, Madam Pomfrey had retired or was thinking of retiring, since Hannah Abbott reportedly applied for the position of Matron at Hogwarts. Madam Pomfrey was described by her students as being exceptionally kind, but even more so strict. She was very obsessive, lining up the sweet boxes belonging to her patients in neat rows, and was intensely worried about all of the students under her care, believing even feasts to be risky. Indeed, she never asked questions about how her patients received their ailments or questioning the sometimes ludicrous stories they told her, but instead immediately set to fixing them up. Healing magic: Madam Pomfrey had a very high understanding of medical charms and could mend broken bones in less than sixty seconds. Transfiguration: She proficient at Transfiguration, being able to quickly and wordlessly conjure a chair for Professor McGonagall to sit on after hearing of the death of Albus Dumbledore. Defence Against the Dark Arts: Pomfrey was able to create a non-corporeal Patronus, a feat that is noted to be difficult. She is also a skilled enough duellist to survive the Battle of Hogwarts, defeating at least one witch and surviving the onslaught of thousands more. She also recognised a Dementor attack and knew immediately to prescribe chocolate, expressing grim approval of Professor Lupin when she learned that he had already treated the student. Poppy juice, better known as opium, is one of the oldest known medicines; it has been used as a painkiller and soporific for, at the very least, thousands of years. King Tut's tomb contained jars of poppy juice, presumably to relieve the pain he suffered from a head injury. Although it is mostly known today as an addictive drug, opium's derivatives, such as morphine and codeine, are vital to modern medicine for their anaesthetic properties. Pomfrey sounds like comfrey, a plant in the borage family which can be made into a soothing salve. Meanings of her names are, therefore, both in some way medically related. Pomfrey cakes are small, sweet lozenges made from the roots of the licorice plant. Licorice also has been a medicinal ingredient for hundreds of years. 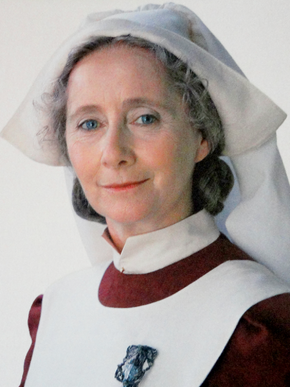 Pomfrey is portrayed by British actress Gemma Jones in the film adaptations of Harry Potter and the Chamber of Secrets, Half-Blood Prince and Deathly Hallows: Part 2. In the film adaptations, Madam Pomfrey wears a cloth in her hair similar to caps worn by British Nurses at various points in history. Her uniform costume as seen in the second film is very similar and could be based on Victorian and Edwardian nurse's uniforms. Her uniform that we see in the 6th and 8th films is very similar and could be based on very early NHS nurse's uniforms from the 1940's and 50's. ↑ As Madame Pomfrey was already working at Hogwarts in 1971, having led Remus Lupin to the Whomping Willow to transform, she must have been at least seventeen years old to be working there. This page was last edited on 10 July 2015, at 11:20. This text is available under the GNU FDL and may have been adapted from the Wikipedia article about Poppy Pomfrey (history).